Countless visitors have perched on Louise Bourgeois’ granite Eye Benches, posed with Donald Baechler’s bronze Walking Figure, and peered into the mischievous faces of Ugo Rondinone’s Moonrise, East. Learn the stories behind these compelling Arts Aventura Mall artworks through complimentary guided tours presented on the first Tuesday evening of every month. Fresh additions and familiar favorites will be explored through discussions led by Margery Gordon, the Founder/Director and Principal Guide of Arts Encounters. 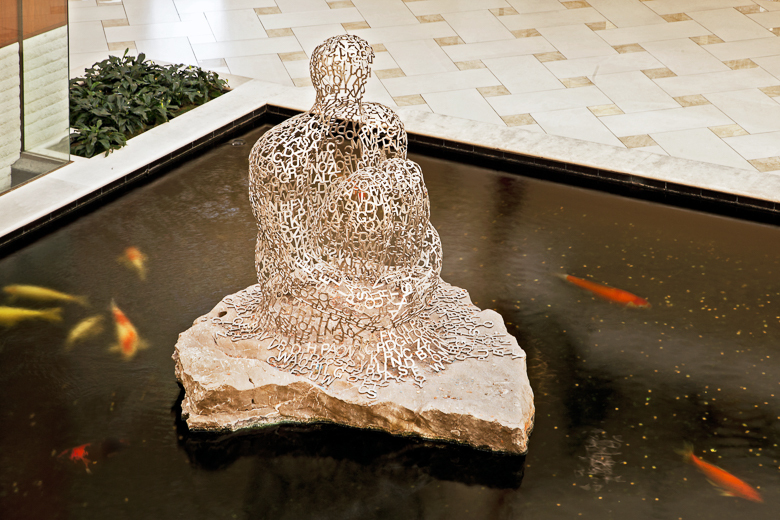 Tour groups meet at 6:30 p.m. at Florida’s Soul by Jaume Plensa in Center Court, next to the koi pond (Refer to the image on the left). The hour-long tour will explore works on multiple levels, ending at Aventura Slide Tower, where attendees can slide down the dramatic spirals or enjoy dinner and drinks at the surrounding restaurants. Advance registration is advised. Please RSVP by clicking here.